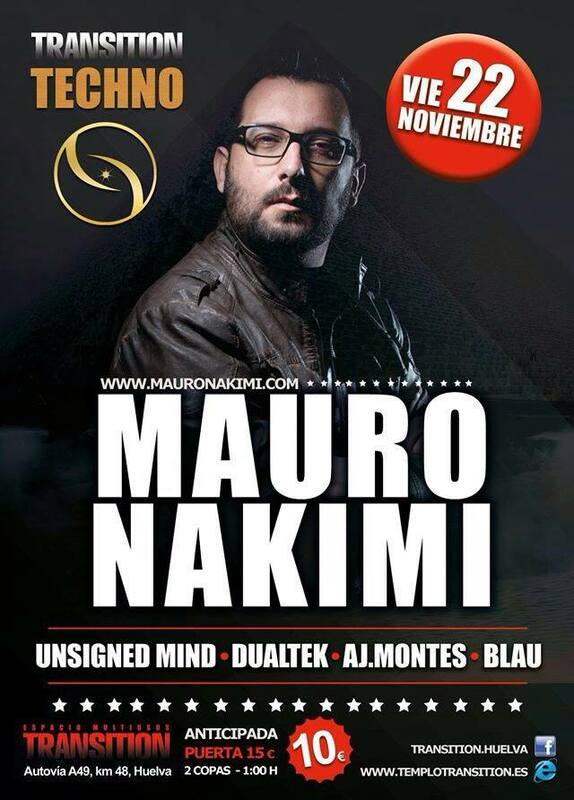 Home › Top › Friday, 22nd of November, Huelva (Spain) Mauro Nakimi is back! Friday, 22nd of November, Huelva (Spain) Mauro Nakimi is back! Next Friday, 22nd of November, at the club Transition (Huelva, Spain), our friend and also appreciated dj Mauro Nakimi is back with an excellent Techno show! Here you have the complete poster of the event and the line up! This is the press release that we kindly received: “The temple of the advanced music of Andalusia TEMPLE TRANSITION takes pleasure in announcing an event that should possess with the most genuine and forceful techno of our national scene, as head of line up we will rely on MAURO NAKIMI, dj and producer of techno with a very long professional career, owner the label group ALIVELAB and advanced production teacher and developer for national and international schools, also we will possess the artists’ presence of UNSIGNED MIND with more than 20 years of professional national and international experience in every sense and a personality that they do that his sets you wake the senses up, DUALTEK the new image of a consecrated producer of the south of our country who shows us his most techno face for this notable day, BLAU the hypnosis throws music, the construction of the sonorous incredibly only forms in his sets for the whole Europe they support this biggest artist whom we will possess for this magic night, and to end this magnificent line up we will tell also with AJ.MONTES that it joins to this so special night to contribute a sound mountain of techno grooves and pure dancefloor contents”. ‹ Saturday 16th of November, Parhasard disco, Abano terme (italy).. welcome to Dazzla!